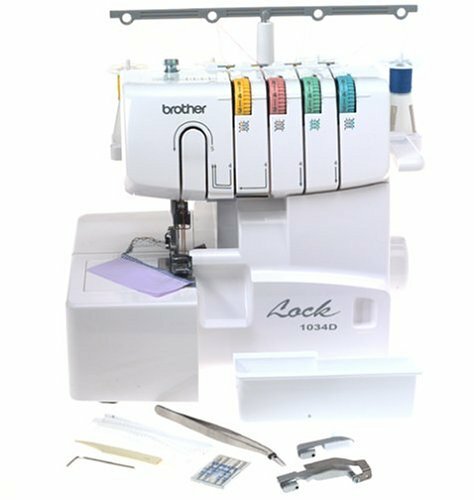 The Brother 1034D serger features a 3/4 lay-in thread system with lower looper threader.Stitch options include 4 thread overlock 3 thread overlock narrow hem rolled hem and ribbon lock stitches.Additionally you can sew blind hem pin tuck and flat lock stitches by purchasing optional presser feet.The machine has a free arm/flat bed convertible sewing surface.The 1034D also offers a F.A.S.T. lower looper threading system for easy thread changes.The differential feed improves sewing results on stretch or thin fabrics to give you a perfect finish. Snap-on presser feet allow quick and easy changes to transition to each desired stitch.The 1034D also includes an instructional video tape to make serging fast easy and fun. This machine does not conform to International electronic codes. Warranty is voided outside the US.